ABOVE VIDEO: Susan talks about her amazing results with BioCellular’s cutting-edge stem cell research and treatment. ABOVE VIDEO: BioCellular Therapies, Jim Eakers talks about the options that stem cell treatment provides over complex surgery and long rehabilitative periods. ABOVE VIDEO: Cynthia and Charles talk about their life-changing results cutting-edge stem cell research and treatment By Dr. Brian Dowdell at BioCellular Therapies. ABOVE VIDEO: BioCellular Therapies patient Teresa and Dr. Brian Dowdell talk about the options that stem cell treatment provides over complex surgery and long rehabilitative periods. Vivace RF Microneedling at Biocellular Therapies Revolution In Contouring, Tightening Face, Neck, Body. Experts at Biocellular Therapies in Melbourne, Florida talk about the revolution in contouring and tightening your face, neck and body. The pursuit of youth and beauty has become an easier journey along the Space Coast with the introduction this month by Biocellular Therapies of the Vivace RF microneedling system, used in conjunction with amnion-based gels and creams for optimum performance in promoting the development of collagen for easing fine lines, wrinkles and uneven skin. 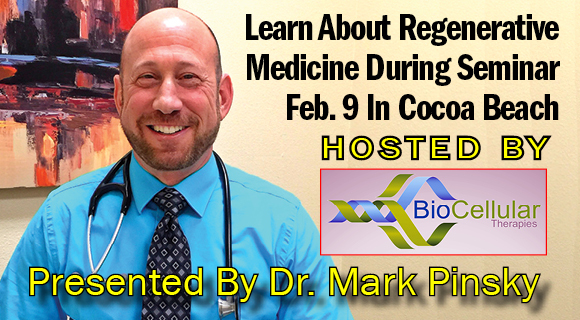 Founder Jim Eaker and Dr. Mark Pinsky recently presenting some exciting and informative information at a live patient seminar about regenerative medicine. Dr. Pinsky has worked closely with high school, college, Olympic and professional athletes. During his 20-year career in Brevard County, Florida, he has served as the team physician for several high schools. Currently, Dr. Pinsky provides care for Viera High School athletes, and is a partner of Medical Associates of Brevard.